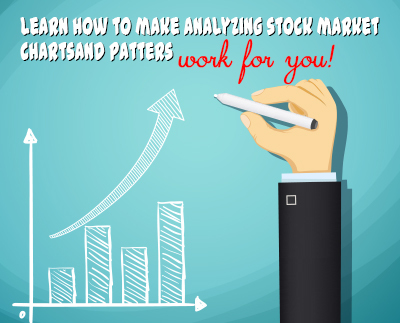 How do you make stock market charts and patterns work for you? Learning to read the market is a lifelong endeavor, but for those few people who master this art, it can be very rewarding. You may have heard trading off of charts and patterns is “voodoo” or it only works if you look at the chart after the fact. These are typical statements you will hear from the majority of people that have not taken time to really study the market. As for me, I am glad they don’t understand it. It only makes it more profitable for those who learn how to trade off of stock charts and patterns. Learning how to read charts is not an easy task. It takes time and patience to get a feel for the different types of patterns. You will find the more you study charts and patterns the more you will start to see and understand how they could unfold. Remember, this is an art not a science. As soon as you think you have it completely figured out the chart will throw you for a loop. As with anything we discuss on this website, no system, chart or pattern is perfect! So don’t expect any chart to always be correct or produce a profit. What is a chart? It is the point by point price of an underlying security. The points could be either on a tick, minute, close, weekly or even monthly time frame. You can set your chart to show you the price over a day, week, month, and year or longer depending on the type of trading you plan on executing. Why do chart patterns work? The chart shows you the areas of supply and demand of a particular security. When the price gets low enough demand comes in and starts buying and when the price gets high enough supply starts to sell. The art is trying to identify areas of supply and demand. I recommend starting with only a handful of chart and patterns. Study these and become an expert at identifying them and understanding how they work. Once you have a few patterns that seem to work, then you will need to develop a strategy to trade each particular pattern. As you work through different stock market charts and patterns you will find that you will gravitate to a few that become your favorite.